Lamont bases his teaching philosophy on the belief that "the world is a University of the Arts" and Language and Performing Arts are at the core. Undoubtedly, students cull their artistic ideas from everyday events, past and present. He has a recurring theme of taking poetry "From the Page to the Stage." 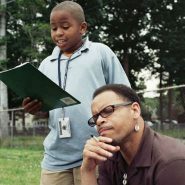 To teach poetry and make it vibrant and relevant, Lamont instructs in a multi-disciplinary manner, incorporating aesthetics of drama and music within his lessons. He aims to academically stimulate the visual, the aural, and the physical in a way that relates to ever-changing social issues. Lamont believes that the oral traditions and aspects of poetry have become a lost art. He professes that a student should not only learn how to write well and creatively, but also how to speak well and creatively. We are now in the midst of a vibrantly relevant and exhilarating era of poetry, whether it's called Spoken Word or Slam. Today poetry is particularly being embraced by young people. From the Harlem Renaissance of the 1920s to the Beatnic era of the 1950s to the Black Arts Movement of the 1960s and into the Hip Hop manifestations of the 1980s, today's Spoken Word poetry seems to enjoying the longest ride, its nimble tentacles reaching into elementary schools even. Lamont feels blessed to be "in the mix" of such a movement, as a workshop provider, performer, mentor, and teacher. Philadelphian Lamont Dixon, aka Napalm Da Bomb, is a poet as well as a performance and teaching artist. He has been a prominent presence on the jazz-poetry scene for many years. As a teaching artist, Lamont demonstrates what he describes as “vibepoetics,” an eclectic mixing of multiple artistic genres to provide dramatic Language Arts education. As a performer, Napalm frequently collaborates with dancers, visual artists, rappers, storytellers, and vocalists, as well as with his band, the The Jazzpoetics. He is a lifelong mentor to aspiring young writers, and for the past seven years has provided writing/performing workshops and has emceed the Free Library of Philadelphia’s annual Teen Poetry Slam. Napalm’s poetry has been published in numerous magazines, including Essence and African Voices. He appears on various CDs: Awaiting the Spirit (Barry Sames), The Po-Jazz Connection (Warren Oree), African Rhythm Tongues (Khan Jamal), and Living in the Now (Luke O’Reilly). In 2007 he debuted Pigments of My Imagination, a CD of music and poetry. Lamont also served as co-executive producer for the Philadelphia segment of HBO’s Russell Simmons’ Def Poetry Jam. Performances: Turkey Hill Ice Cream Arts Festival, Chrysler National African-American Cultural Expo, Philadelphia’s Welcome America!, Children’s Hospital of Philadelphia, Music City’s Jazz & Arts Festival in Jackson, TN, Garden State Children’s Discovery Museum, PA Multi-Cultural Affairs Congress, DuPont’s Clifford Brown Jazz Fest., West Oak Lane Jazz Fest., Philadelphia Drug Enforcement Agency, State Corrections Institutes at Graterford and Chester PA, Philadelphia U.S. Mint, and the National Assn. of Black Storytellers’ Annual Conference. Teaching Affiliations: NJ & PA State Council for the Arts, Rutgers Univ. Center for the Arts, Rowan Univ. (adjunct), Free Library of Philadelphia, NJ Poetry Out Loud National Recitation Contest (instructor/judge/performer). The National Black Authors Tour presented Lamont Dixon with the “2014 Philadelphia Black Poetry Honors” certificate and medal for “20 Years of Poetic Excellence within the Philadelphia Poetry Circuit and Community”.